preparation cause a range of care issues for the bonsai enthusiast. developed to cope with the cold weather by entering a period of dormancy. Proper preparation for winter starts during the autumn. to give them everything they need to be ready for the cold. position out of the wind or sun. When does the cold kill? Generally speaking most trees from temperate parts of the world can be left unprotected until the weather gets down to -10. When it gets colder than this, protection is required. Exceptions to this include Trident Maples, Azaleas and Loropetalums. It’s important to research the kinds of trees hat you have to find out the degree of cold which they can stand. A greenhouse is probably the best solution for protecting trees from the worst of the weather. An unheated outbuilding can be used to protect deciduous trees. Since deciduous trees don’t need light when not in leaf, they can be stored in shed, outhouses or garages when the weather gets cold. Bonsai growers often construct benches in order to display their trees to best effect in the garden. Dropping the trees under the benches and then covering the bench top and sides with bubble wrap or something similar can be enough protection. 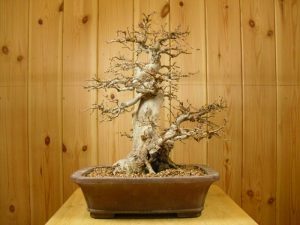 Another solution is to take the trees out of their bonsai pots and plant them out into the garden. This can provide the protection from the cold that the roots of the trees require. When the spring comes they can simply be potted back into the same pots. As with planting bonsai out in the garden over winter, you can take the trees out of their pots and plant them into larger wooden boxes filled with garden soil.